We've got a new Seize The Birthday challenge for you, and this time our optional topping is Make Us Laugh. Or you can just play along with our Anything Goes theme. This Art Impressions stamp has been sitting on my desk waiting to be used for, oh, well over a year. I couldn't put it away otherwise I'd forget all about it, so today it got its first outing. 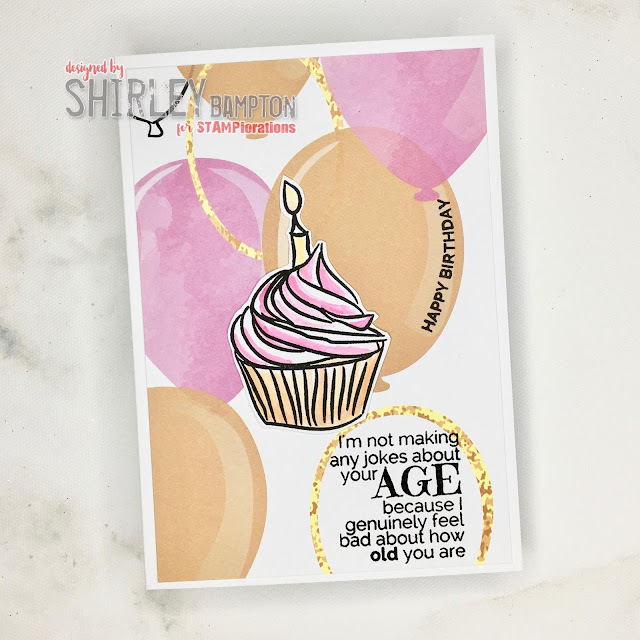 The sentiment is from Paper Artsy Elinazinski Art ZA26, and the Happy Birthday is from Altenew. 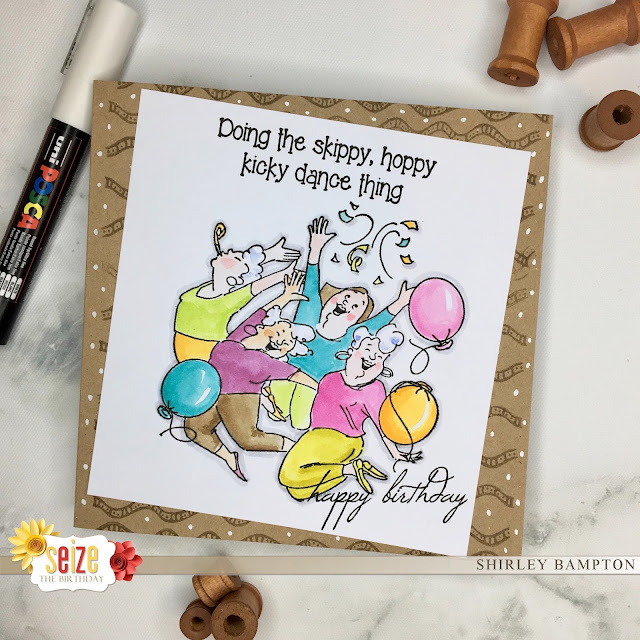 Pop on over to the Seize The Birthday blog for some more inspiration from our surprise party guest, Julie, and the rest of the design team, and hopefully we'll see you in the gallery. Hello there! We've got some Tuesday inspiration for you on the STAMPlorations blog, and today we're featuring Shery's stamps. 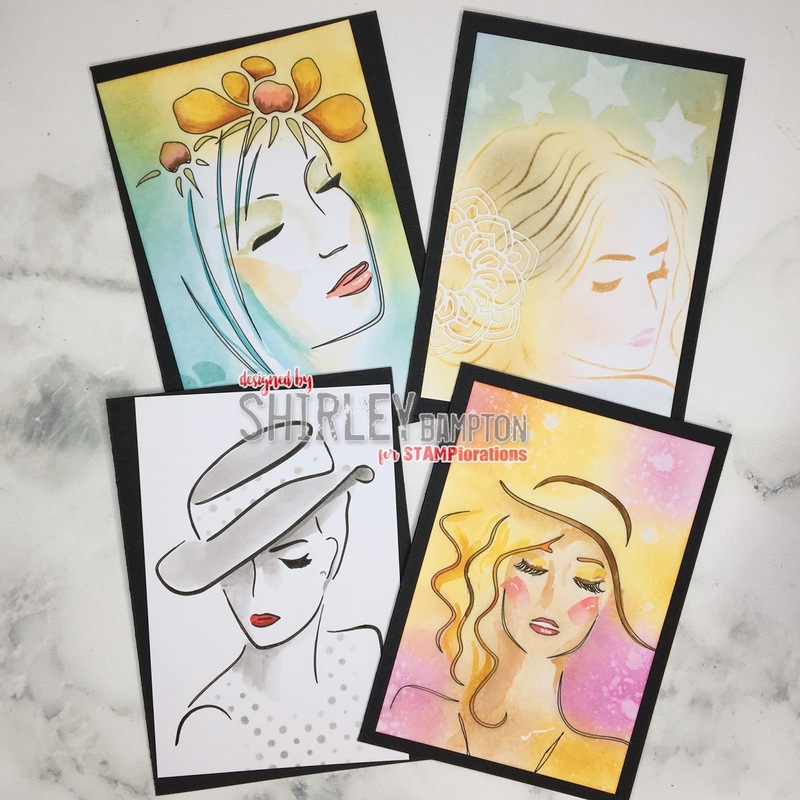 For the next week all Shery's stamps are 10% off, and if you use my code STAMPGIRLSHIRLEY you'll get a further 20% off most stamps stencils and dies in the store. I used the new ARTplorations stencil Faces: Pensive stencil, but I didn't stencil the eyelashes so that I could draw in some eyes. 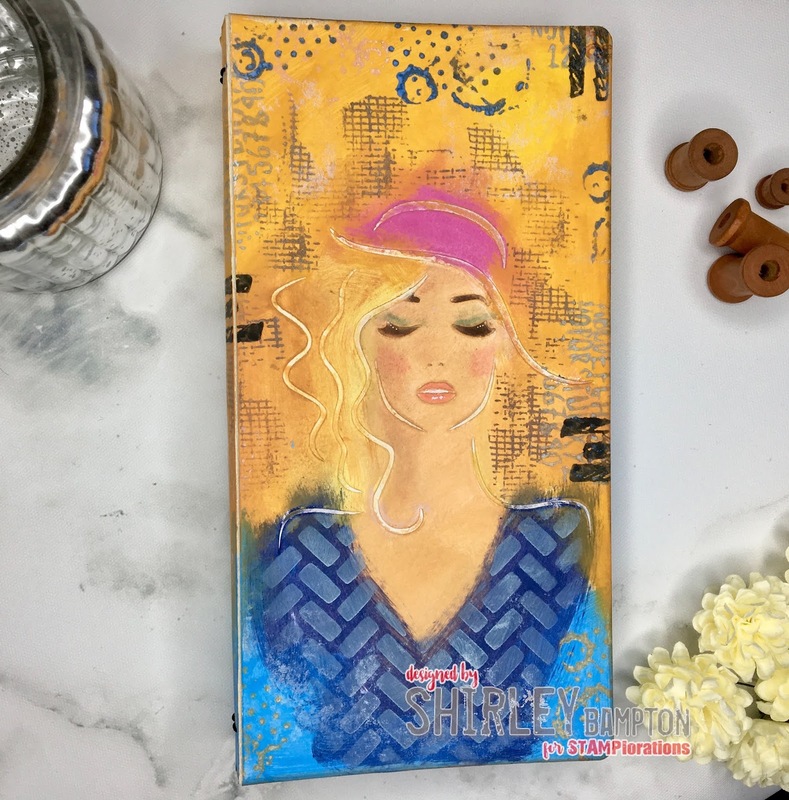 The sentiment is from Bold Sentiments: Fabulous , and the other stencils I used are ARTplorations stencil Bloom Boldly and ARTplorations Stencil Pebble Waves. For her scrunchy I die cut one of the mandalas from CUTplorations Dies Bloomdala Bliss: Felicity. Pop on over to the STAMPlorations blog for some more fabulous inspiration using Shery's stamps, and don't forget to leave a comment for your chance to win a gift voucher to the store. 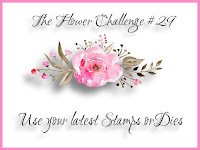 Helloooo, and welcome to Inspiration Tuesday at STAMPlorations. 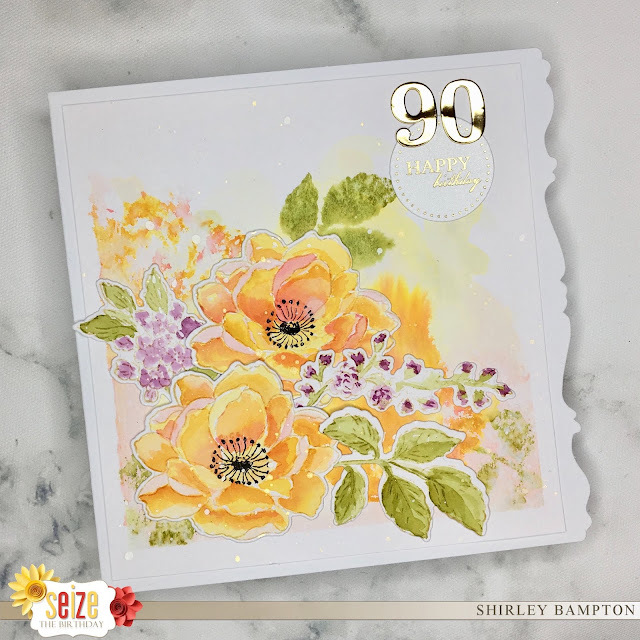 Today we're focusing on Deepti's line of stamps, Dee's Artsy Impressions. For the next week all of Deepti's stamps are 10% off (no coupon needed), and if you use my code STAMPGIRLSHIRLEY you'll get a further 20% off most stamps stencils and dies in the store. I've used a gorgeous dessert from Sweet Surprise, coloured it with Sharpies and fussy cut it. 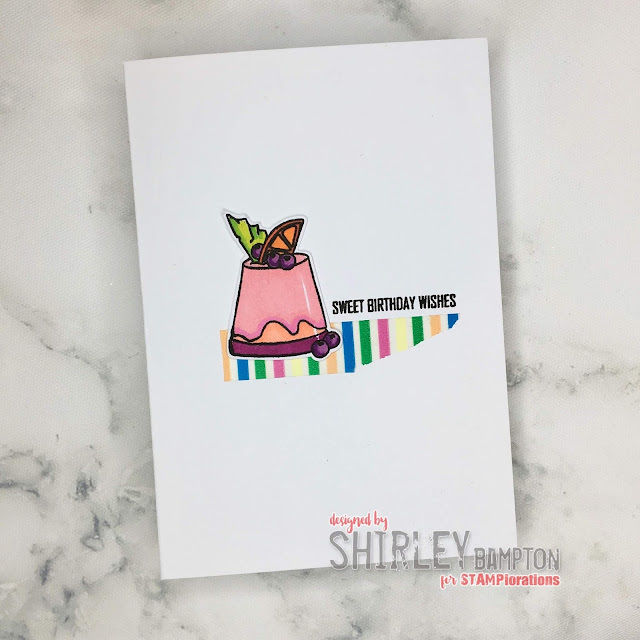 I adhered some torn washi tape to my card, added a sentiment from Little Love Birthday Wishes and added my dessert. I could eat one of those in real life!! 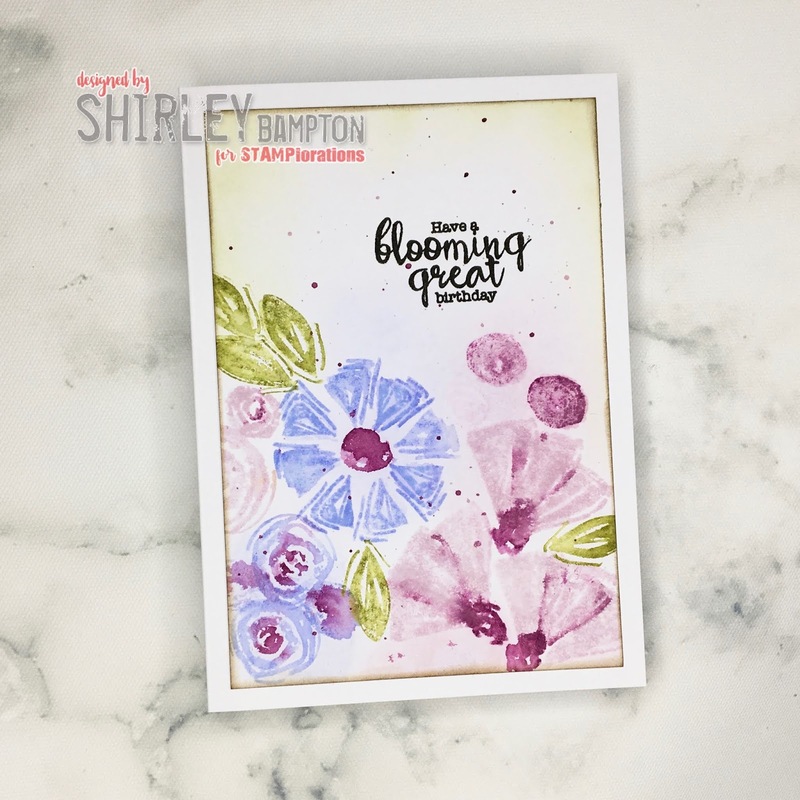 Pop on over to the STAMPlorations blog for some more fabulous inspiration using Deepti's stamps, and don't forget to leave a comment for your chance to win a gift certificate to the store. 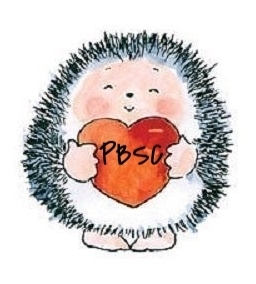 Helloooo! I recently got the Zen Coffee Cup Layering Dies and I wanted to try them out using patterned paper. I cut one solid outline cup in white, then the filigree flower from patterned paper and adhered it on top of the solid diecut using bookbinders glue in a fine nozzle applicator. For the shadow I smudged Distress mini pads in Spun Sugar and Shabby Shutters across the card, rubbed with a piece of kitchen roll then splattered water and blotted. The sentiment is from my set And Coffee. STAMPlorations are having a coffee-themed sale here, so if you're thinking of stocking up on coffee-themed stamps, get on over. 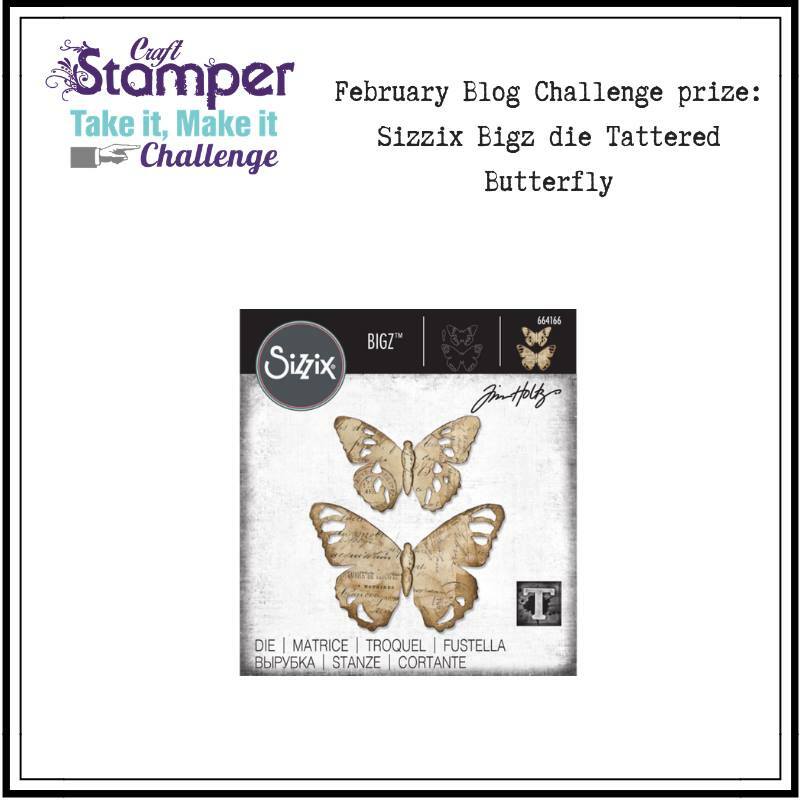 Hi, and welcome to a new Seize The Birthday challenge! 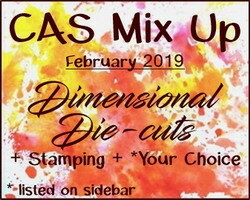 This time, it's anything goes, so as long as it's a birthday project, you're in. My card was totally inspired by this card from Debby Hughes. Nowhere near her standard, but a decent effort nonetheless. 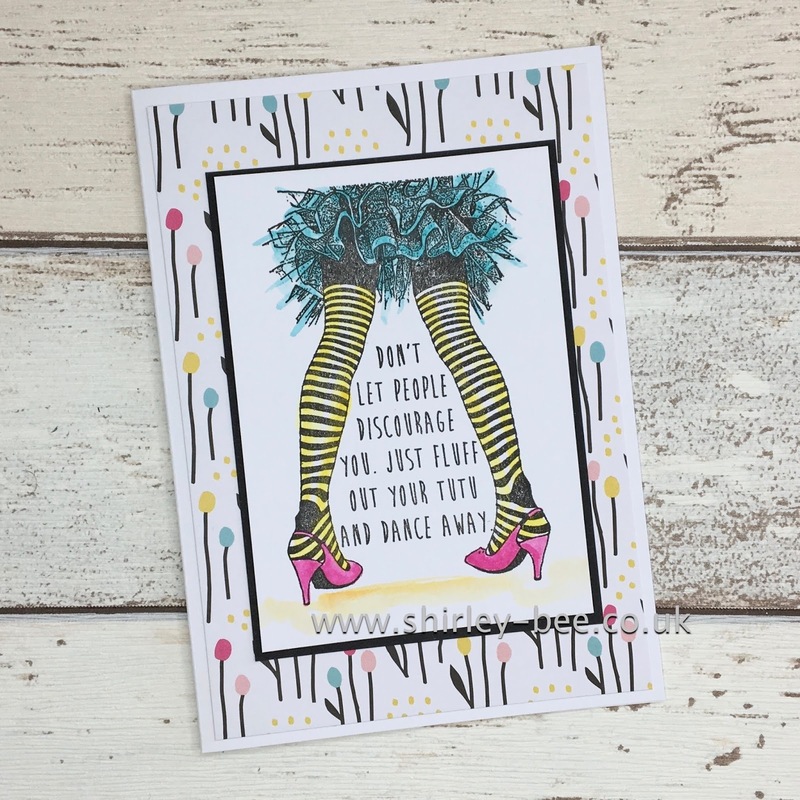 Pop on over to the Seize The Birthday blog for some more fabulous inspiration from the team and from our Surprise Party Guest, Julie, and while you're there, why not play along? Stamps and dies are Altenew Beautiful Day, birthday disc from Craftwork Cards (ancient stash), number dies from Winnie & Walter. 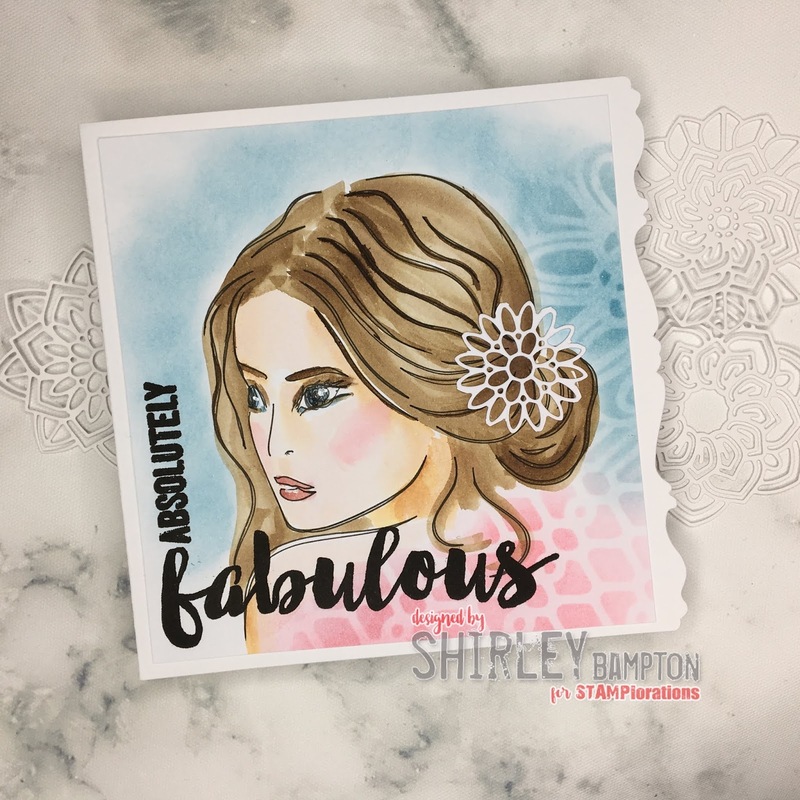 I'm over on the STAMPlorations blog with these cards using the new Faces range of stencils. Pop on over for a closer look. 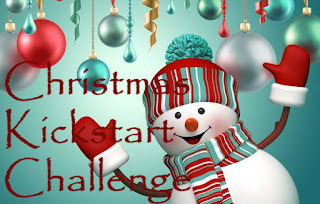 I'm playing along for the first time in the Christmas Kickstart challenge, where the theme is Festive Felines. 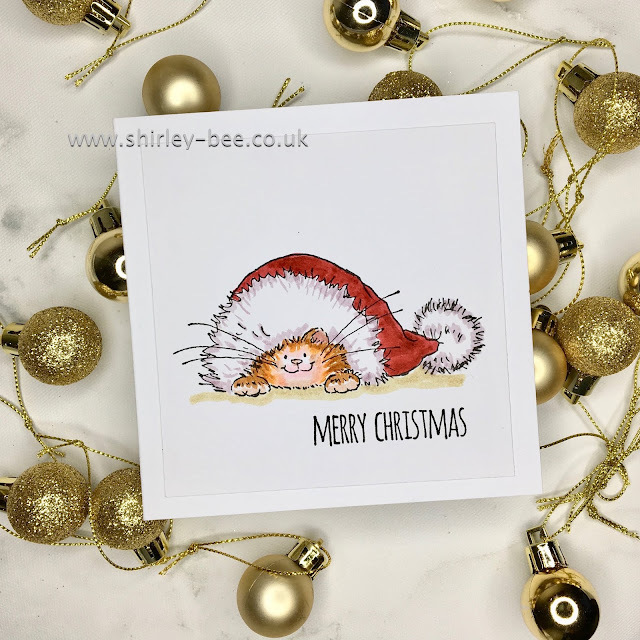 Most of my Christmas stamps are packed away, but I have a small stash of already-stamped images, and I found this little kitty in the midst of them. And seeing as he's a Penny Black image, I'm playing along with Penny Black Saturday challenge Anything Goes. My first Christmas card of 2019!